It’s been quite some time since I’ve been to a movie theatre packed with kids and I must say that I did enjoy hearing them laugh. I think I enjoyed the sound of laughter more than I did the movie. That doesn’t mean though that Night at the Museum 2 wasn’t funny because it did have some good moments even if I did have to fight boredom towards the middle of the film. Thankfully Kahmunrah was there to destroy the world and save the movie because for me he provided the biggest laughs. Hank Azaria really did a great job with all the three characters he played, i.e. Kahmunrah, The Thinker, Abe Lincoln. The rest of the cast did their jobs pretty well too though I was a bit disappointed with how little they made use of Robin William’s talent. 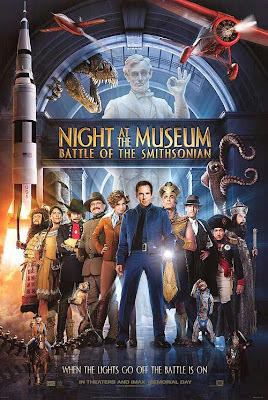 As for the plot of the story there isn’t much you can say about it because there’s really not much of a story beyond Larry Daley (Ben Stiller) running around, in, and under the Smithsonian trying to save his wax friends and the world from Kahmunrah. The attempt to add depth to the story by giving us a lesson on doing what we love was more like an afterthought just so we can say that the movie had a story beyond trying to get some good laughs out of the audience. The ending was fun but ruined by the oh so corny appearance of the reincarnation/complete opposite of Amelia Earhart (Amy Adams). All in all the movie was funny enough but I could have lived without seeing it on the big screen. Also, I would have much rather seen Jonah Hill at the end instead of the bizzaro world Amelia Earhart/Amy Adams business.